"For me, it is knowing that I am completing a family and saving a life." 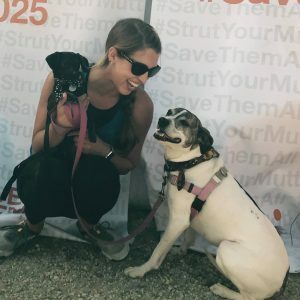 Arielle Wait is the Deputy Director for Lucky Dog Animal Rescue and manages all of Lucky Dog’s adoption, volunteer and animal care programs. Arielle’s work with Lucky Dog began, as many volunteers do, as a handler at adoption events. She quickly became more involved, fostering dogs, coordinating adoptions and even coordinating adoption events. She was first hired to serve as Lucky Dog’s Event Team Lead before being promoted to Program Manager and now the Deputy Director. Q: What is your favorite part of adoption events and coordinating adoptions? Q: Are there any adoption stories that stand out to you? Q: What recommendations do you have for people wanting to get involved in animal rescue?